ClubCoins Needed: 160 Please note that this item is not available on your device. You may add the item to your Wish list and redeem from a compatible device. The real war on terror has happened largely behind closed doors, run by the White House, drawing on secret intelligence and operations around the world. There is no man who knows more about it than Richard Clarke, the former Counterterrorism Czar for both George W. Bush and Bill Clinton, the man who has led our efforts against al Qaeda and all other terrorist enemies for years, serving under seven… presidents and in the White House for George H. W. Bush, Bill Clinton and George W. Bush, until he resigned in March 2003. He has had a front-row seat at every major battle in this war, from the first World Trade Center bombing, to 9/11, to Afghanistan, to Iraq. Clarke knows the secret stories of Bill Clinton's great victories -- shutting down anti-U.S. terrorism sponsored by Iran and Iraq -- and his great frustrations -- failing to kill Usama Bin Laden despite many attempts. When President Bush took office, Clarke was ready to present him with a master plan to roll back and destroy al Qaeda -- yet the president did not grant a briefing for months. His aides had little interest in Usama Bin Laden, preferring to talk about Saddam Hussein at every turn. Clarke knows why we failed to shut down terrorist financing within our borders prior to 2001. After ignoring existing plans to attack al Qaeda when he first took office, George Bush made disastrous decisions when he finally did pay attention. 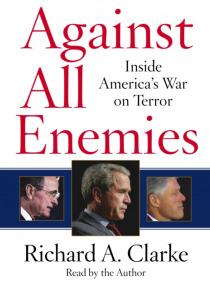 Thanks to the determined, even conspiratorial views of Wolfowitz, Rumsfeld, and Bush, we went after the wrong enemy. The charges Clarke levels against the current administration must be taken seriously by every American, Democrat or Republican. Our security depends upon it.